The Iron Curtain may theoretically be gone, but it still feels like most American decadent yankee pig-dogs probably know more about the Marvel Comics universe than they do about modern-day Russia. But not us here in international-city Cleveland. We know all about the DC universe too! 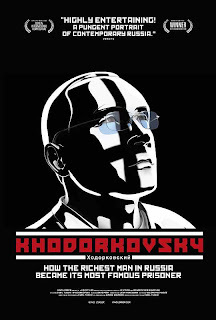 (rimshot) Anyway, the German documentary KHORDOVKOVSKY, truly a nonfiction thriller, is an eye opener for the ignorant, going into such colorful details as Siberian oil boomtown Khanty-Mansysk and a Russian economist who is also a popular poet-philosopher. The feature brings out a saga worthy of a John LeCarre thriller (or a Justice League one, take your choice). It's documentarian Cyril Tuschi's stylish dossier on fallen Russian "oligarch" Mikhail Khordovkovsky. We're told up front (in one of the bursts of striking monochromatic CGI animation) that Khordovkovsky is now in prison-exile in Siberia. None other than President George W. Bush (in typical malaprop fashion) publicly demanded the man's release, in the name of "democracy." The rest fills in the Byzantine backstory on this questionable hero. Khordovkovsky was something of a matinee idol among the new breed of mega-capitalists who took over the superpower's economy after the collapse of the USSR. Of Jewish descent but raised seemingly a true believer in Russian-socialist national identity, selfless work-ethic and class-free cooperation, Khordovkovsky took over as chief of the gasoline company Yukos. This deal made the handsome comrade into the world's richest man (an $8 billion fortune) under 40. But, according to his security chief (an ingratiating ex-KGB-general) success in joining the "oligarchs" of the free market Russia came with paid protection deals to the ubiquitous Russian mobsters, and similar backroom compromises with the Kremlin. Yes, if you thought Cuyahoga County was corrupt, the former Soviet Union makes us look like, er, Summit County by comparison (or vice versa). 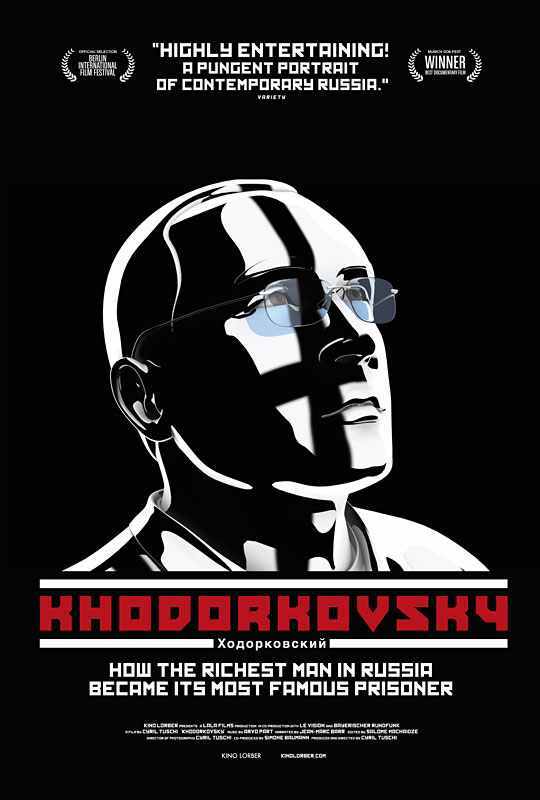 Many of the interviews take place with former Khordovkovsky associates now living outside Russia, for their own safety, or investigative journalists who live with fear of assassination (in the USA investigative journalists live with a very real fear of not landing that big Lady Gaga interview because they piss off the parent-company conglomerate who owns her. As Yakov Smirnoff would say, what a country!). While the nouveau-riche "oligarchs" of Russia, with their vulgar spending, embezzling, and gangster-like glamor, brought them reputations not unlike the Capones and the Sopranos, Khordovkovsky lived modestly, advocated social reforms and was one of the better of a bad bunch. Still, he may have dirtied his hands with at least one ordered killing (of an enemy mayor). His sudden arrest in 2003 was allegedly for tax evasion (a la Capone). But he may have hastened his way to Siberia by breaking a secret promise to the government not to meddle in political affairs and endorsing candidates contrary to President Vladimir Putin. There is even a conspiratorial suggestion that Khordovkovsky gave himself winningly to unjust imprisonment, which he uses as an aura of martyrdom to boost his own political ambitions, a la Nelson Mandela. This is an unfinished drama, and KHORDOVKOVSKY may be a true-crime expose write large - but it's Crime and Punishment large, complete with a moral near the conclusion, worthy of a great Russian novelist, verbalized by Khordovkovsky's exiled son in America.